The Draft Eisenhower movement was the only successful political draft of the 20th century to take a private citizen to the Oval Office. It was a widespread American grassroots political movement that eventually persuaded Dwight D. Eisenhower to run for President. The movement culminated in the 1952 presidential election in which Eisenhower won the Republican nomination and defeated Democrat Adlai Stevenson to become the 34th President of the United States. Dwight Eisenhower enrolled at the United States Military Academy, West Point, New York, in June 1911, and graduated in 1915. During World War I, he was denied a request to serve in Europe, and instead commanded a unit that trained tank crews. Following the war, he served under several notable generals, and was promoted to the rank of brigadier general in 1941. He was responsible for planning and supervising several key wartime operations, including the invasions of: North Africa (1942), Sicily (1943), and France, along with the 1944–45 Germany along the Western Front. He ultimately rose to the rank of five-star general in the United States Army during the course of the war, and served as Supreme Commander of the Allied Expeditionary Forces in Europe. In November 1945, he was named Chief of Staff of the U.S. Army, and in December 1950 was named Supreme Commander of the North Atlantic Treaty Organization (NATO), and given operational command of NATO forces in Europe. Eisenhower also served as President of Columbia University from 1948 until 1953. He retired from active service on May 31, 1952. Draft Eisenhower movements had emerged ahead of the 1948 election, mostly in the Democratic Party; in July 1947, Truman offered to run as Eisenhower's running mate on the Democratic ticket if Douglas MacArthur won the Republican nomination. Eisenhower rejected all requests to enter politics. He considered making a statement "similar to Sherman's", but did not reject running for the presidency as definitively as William T. Sherman because, as he wrote to Walter Bedell Smith, "I do not believe that you or I or anyone else has the right to state, categorically, that he will not perform any duty that his country might demand of him". During 1947, momentum grew for the Draft Eisenhower movement—enough that on September 10, 1947, Eisenhower disclaimed any association with what the press was calling the "Eisenhower Boom." In mid-September 1947, US Representative W. Sterling Cole of New York voiced opposition to the nomination of Eisenhower or any other military leader, including George C. Marshall or Douglas MacArthur. In December 1947, an actor impersonating Eisenhower sang "Kiss Me Again" during a political dinner in Washington, DC, whose attendees included Truman (Democratic incumbent) and numerous Republican potential candidates: the song's refrain ran "...but it's too soon. Some time next June, ask me, ask me again, ask me, ask me again." On April 3, 1948, Americans for Democratic Action (ADA) declared its decision to support a Democratic Party ticket of Eisenhower and Supreme Court Judge William O. Douglas due to Truman's lack of popular support. ADA also expressed its fear of the candidacy of former US Vice President Henry A. Wallace, his opposition to the Marshall Plan, and Wallace's support for Soviet appeasement. 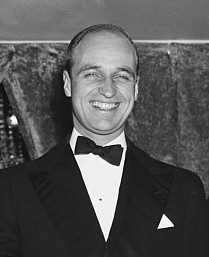 Adolf A. Berle Jr. and Franklin Delano Roosevelt Jr. expressed their belief that Eisenhower would accept the nomination. On April 5, 1948, Eisenhower stated again that he would not accept a nomination. By mid-April 1948, American labor unions entered the debate, as William B. Green, president of the American Federation of Labor (AFL), criticized the Congress of Industrial Organizations (CIO) for supporting the "Eisenhower Boom." I will not, at this time, identify myself with any political party, and could not accept nomination for public office or participate in a partisan political contest. Support persisted nonetheless, and on July 6, 1948, a local Philadelphia group seized on Eisenhower's phrases about "political party" and "partisan political contest" and declared their continued support for him. The same day, Truman supporters expressed their satisfaction with the Eisenhower memo and confidence in the nomination. By July 7, 1948, the week before the 1948 Democratic National Convention, the Draft Eisenhower movement drifted onwards, despite flat denials by Eisenhower and despite public declarations of confidence by Truman  and Democratic Party national chairman J. Howard McGrath. Nevertheless, 5,000 admirers gathered in front of Eisenhower's Columbia residence to ask him to run. Senator Claude Pepper of Florida called on the Democratic party today to transform itself temporarily into a national movement, draft Gen. Dwight D. Eisenhower as a "national" and hence "nonpartisan" Presidential candidate and promise him substantial control of the party's national convention opening in Philadelphia next week. It would be necessary, Mr. Pepper suggested, for the convention to invite General Eisenhower to write his own platform and to pick the Vice~Presidential nominee. Moreover, the Senator said, the general should be assured that the Democrats would never make partisan claims on him, and he should be presented not as a "Democratic" candidate but the candidate of a convention "speaking not as Democrats but simply as Americans." When Eisenhower declined again, Pepper joined the Party in supporting Truman. (Pepper also made a bid for presidential candidacy but withdrew it.) On the evening of July 9, 1948, Roosevelt conceded at "Eisenhower-for-President headquarters" that the general would not accept a nomination. During the convention (July 12-14, 1948) and after, concern persisted that the Eisenhower Boom had weakened Truman's hopes in the November 1948 elections. The Eisenhower Boom was over–for 1948. The time from 1951 to 1952 has been called the American "Winter of Discontent". Americans were frustrated by the stalemated Korean War, with no clear end in sight, and Truman would not commit to seeking another term. The Draft Eisenhower movement reemerged in 1951 in both the Republican and Democratic parties, as Eisenhower had not yet announced any political party affiliation and believed that he needed to remain nonpartisan, citing Army regulation 600-10.18.i forbidding partisan political activity by serving officers. Democrats sought a candidate who could help them retain the White House after Truman, who many felt could not win re-election. Hoping that Eisenhower would run on behalf of the Democratic Party, Truman wrote to Eisenhower in December 1951, saying: "I wish you would let me know what you intend to do." Eisenhower responded: "I do not feel that I have any duty to seek a political nomination." Republican New York Governor Thomas E. Dewey and Senator Henry Cabot Lodge, Jr. of Massachusetts meanwhile worked to persuade him to run. Lodge began encouraging Eisenhower to run more than two years before the 1952 Republican National Convention, and Dewey on 15 October 1950 had announced his support for the general. Irving Berlin even included a song called "They Like Ike" in his Broadway Musical Call Me Madam, which opened in October 1950. Republican admirers coined the phrase "I like Ike" (referring to "Ike", Eisenhower's nickname) in the spring of 1951 as a symbol of their hopes. The "I Like Ike" slogan was created when Peter G. Peterson of Market Facts (who would later be Secretary of Commerce under Richard Nixon) did research for the campaign and found out more people wanted to talk about how they trusted and felt comfortable with Ike, rather than describing their views on all the issues. Thus, "I Like Ike" went on all Ike paraphernalia. Eisenhower had told Kansas newspaper editor Roy A. Roberts in 1947 that he was "a good Kansas Republican like yourself". Although Roberts disclosed their conversation in 1951, Americans remained uncertain of Eisenhower's politics. Although he believed that he would win the presidency more easily and with a larger congressional majority as a Democrat, Eisenhower believed that the Truman administration had become corrupt and that the next president would have to reform the government without having to defend past policies. The internationalist wing of the Republican party, in turn, saw Eisenhower as an alternative to the more isolationist candidate, Senator Robert A. Taft who, before the primaries, was widely considered by insiders to be the frontrunner for the nomination. While Taft had voted against NATO, Eisenhower believed that the United States and its allies needed to oppose Communism through NATO and other collective security efforts. 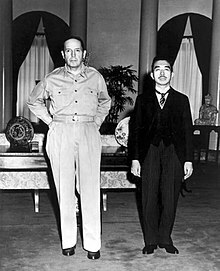 He hoped to settle the issue before taking the NATO post in Paris and met with Taft at the Pentagon in January 1951. Eisenhower offered to make a Shermanesque statement rejecting any possibility of running for the presidency if Taft agreed to support collective security with Europe. Taft refused. During 1951, more Republican politicians announced their support for Eisenhower, while Democrats continued to assure him that he could win the presidency as a Democrat. Taft announced his candidacy for the Republican nomination on 16 October. On November 17, Lodge became the campaign manager for the Draft Eisenhower movement, still without any authorization from its candidate. By December, the movement had grown to the point that Eisenhower had his friend Clifford Roberts secretly organize a political advisory group of close, trusted persons to watch it, and as momentum behind Taft's candidacy grew, Eisenhower's reluctance to run declined. Lodge was perhaps the most vocal, effective, and persistent supporter of the movement, and after months of argument, persuaded Eisenhower to at least not repudiate a draft movement; Eisenhower also told Lodge that he was a Republican, which Lodge revealed during a January 6, 1952 press conference. Eisenhower announced through the military that Lodge was correct, and that while he would not ask to be relieved of his NATO assignment for political reasons, if the Republican party gave him "a duty that would transcend my present responsibility" at the convention in July and nominate him, he would run. On January 6, 1952, Lodge entered Eisenhower's name into the New Hampshire primary ballot without Eisenhower's permission. Soon 24 newspapers including The New York Times endorsed Eisenhower, and Senator Paul Douglas even suggested that both parties nominate Eisenhower with differing vice-presidential running mates. For several weeks Eisenhower was a non-participant, however, and would not speak out on his views or declare himself a candidate. Through January and February Eisenhower wrote to friends and family members saying that he was flattered by the movement, but did not really believe it was as widespread as the media implied. On February 8, the movement demonstrated its size. A Draft Eisenhower rally was scheduled to be held in Madison Square Garden on that day. The event planners expected no more than the arena's 16,000-person capacity, but over 25,000 showed up, and the New York City police and fire marshals could get very few people to leave. On February 11, famous businesswoman and aviator Jacqueline Cochran flew to Paris to show Eisenhower Serenade to Ike, a tribute film she had made. The film visibly touched Eisenhower, who began to shed tears when, at the end of the film, Cochran toasted to Eisenhower, saying, "To the President of the United States." Eisenhower later wrote of the event, describing his inner turmoil by stating, "I've never been so upset in years." Despite remaining in Paris and doing no campaigning other than stating that he would run if nominated by the Republicans, on March 11, Eisenhower won the New Hampshire primary against Taft by 50% to 38% and captured all of the Republican delegates. Eisenhower announced that he was "astounded" and "moved" by the results and told a reporter, "Any American who would have that many other Americans pay him that compliment would be proud or he would not be an American." On 18 March, more than 106,000 voted for "Eisenhower", "Isenhowr", or "Ike" as a write-in candidate in the Minnesota presidential primary, only 20,000 behind favorite son Harold Stassen, who was on the ballot. That so many fellow citizens viewed him as "Ike" especially pleased the surprised general, who asked to be relieved of his NATO assignment and retired from the military on June 2. On June 4, Eisenhower made his first political speech in his home town of Abilene, Kansas. Eisenhower won the Republican nomination and defeated Adlai Stevenson in the general election in November 1952. ^ "Truman Wrote of '48 Offer to Eisenhower" The New York Times, 11 July 2003. ^ a b c d e f g h i j k Pusey, Merlo J. (1956). Eisenhower, the President. Macmillan. pp. 4, 6–14, 17–18, 22, 45–46. ^ "Eisenhower Boom is Deplored by Him: Eisenhower Decries Boom for Him As Landon Offers Kansas Backing". New York Times. 10 September 1947. Retrieved 29 December 2018. ^ "Cole of House Hits Eisenhower Boom". New York Times. 14 September 1947. Retrieved 29 December 2018. ^ "Eisenhower Boom a Gridiron Morsel". New York Times. 14 December 1947. Retrieved 29 December 2018. ^ "Democrats Urged to Run Eisenhower". New York Times. 4 April 1948. p. 45. Retrieved 28 December 2018. ^ "Eisenhower Says Position Is 'Absolutely Unchanged'". New York Times. 6 April 1948. Retrieved 29 December 2018. ^ "Green Hits CIO Talk of Eisenhower Boom". New York Times. 14 April 1948. Retrieved 29 December 2018. ^ "Eisenhower Query Laid to President: Newspaper Says George Allen Will Ask Clear Declination". New York Times. 3 July 1948. Retrieved 29 December 2018. ^ "Georgia, Virginia Back Eisenhower, Denounce Truman". New York Times. 3 July 1948. Retrieved 29 December 2018. ^ "Virginia Raises Eisenhower Boom". New York Times. 3 July 1948. Retrieved 29 December 2018. ^ "Georgia Champion Boom for Eisenhower". New York Times. 3 July 1948. Retrieved 29 December 2018. ^ "Eisenhower Draft Urged by Mahoney: 'Strongest' Candidate, Ex-Justice Says". New York Times. 3 July 1948. Retrieved 29 December 2018. ^ "Quoting Eisenhower as Receptive Denied". New York Times. 5 July 1948. Retrieved 29 December 2018. ^ "Report Says Eisenhower Asks Choice by Truman". New York Times. 5 July 1948. Retrieved 29 December 2018. ^ "Eisenhower Boom Gaining Headway in Fight on Truman: Survey of 48 States Reveals Battle Faced by President in Swings of Delegates". New York Times. 5 July 1948. Retrieved 29 December 2018. ^ "50 Top Democrats Back Rights Plank: They Meet in Minneapolis and Issue Statement". New York Times. 5 July 1948. Retrieved 29 December 2018. ^ "Illinois May Nominate: Arvey Predicts Convention Stampede for Eisenhower". New York Times. 5 July 1948. Retrieved 29 December 2018. ^ "Stennis for Eisenhower". New York Times. 6 July 1948. Retrieved 29 December 2018. ^ "Eisenhower Says He Couldn't Accept Nomination for Any Public Office". New York Times. 6 July 1948. Retrieved 29 December 2018. ^ Moscow, Warren (7 July 1948). "Eisenhower Boom Rolls on into Party Despite His Stand". New York Times. Retrieved 29 December 2018. ^ "Committee Presses Eisenhower Draft". New York Times. 6 July 1948. Retrieved 29 December 2018. ^ "Eisenhower Stand Buoys Truman Men". New York Times. 6 July 1948. Retrieved 29 December 2018. ^ "Eisenhower Draft Wanes Amid Split: Eisenhower Draft Recedes As New York Leaders Split". New York Times. 8 July 1948. Retrieved 29 December 2018. ^ "Truman's Confidence Grows: Aides See Opposition Halted". New York Times. 7 July 1948. Retrieved 29 December 2018. ^ "Eisenhower's No 'Final' to M'Grath: Democratic Chairman Holds Truman Nomination Assured". New York Times. 8 July 1948. Retrieved 29 December 2018. ^ "5,000 Admirers Call at Eisenhower Home". New York Times. 8 July 1948. Retrieved 29 December 2018. ^ Thomas, Reginald (31 May 1989). "Claude Pepper, Fiery Fighter For Elderly Rights, Dies at 88". New York Times. Retrieved 28 December 2018. ^ "Pepper Proposes New Party Policy; Advocates Dropping Partisanship and Drafting Eisenhower as a Crisis President". New York Times. 7 July 1948. Retrieved 28 December 2018. ^ "Eisenhower Draft Recedes As New York Leaders Split". New York Times. 8 July 1948. Retrieved 29 December 2018. ^ Lawrence, W.H. (14 July 1948). "Barkley to Be Truman Running Mate: Floor Fight Looming on Civil Rights". New York Times. Retrieved 28 December 2018. ^ "James Roosevelt Bows to General: Prime Mover in Eisenhower Boom Accepts 'No'". New York Times. 10 July 1948. Retrieved 29 December 2018. ^ Krock, Arthur (11 July 1948). "Anti-Truman Campaign a Boomerang to Party". New York Times. Retrieved 29 December 2018. ^ "Liberals Seen Set to Back President: Former Eisenhower Groups Begin Task of Retracing Steps to Truman's Side". New York Times. 22 July 1948. Retrieved 29 December 2018. ^ a b c d e f g h 50 Years Ago, Winter of Discontent, Winter 1951-52. The Eisenhower Institute. 2006. ^ Southern Review of Books, Vol. 7, No. 1, January 2009. ^ a b Ike Offers Not to Run for President. Dwight D. Eisenhower Memorial Commission. 2004. ^ a b c Immerman, Richard H. John Foster Dulles Lanham, Maryland: Rowman & Littlefield, 1998. This page was last edited on 24 February 2019, at 22:17 (UTC).